Two weeks ago if you would have told someone in southern Minnesota that most of the snow would melt in two weeks, you probably would have received some laughs. Yet here we are in mid-February, and that is indeed the case. At the beginning of last week temperatures were still below zero, and only yesterday the temperature nearly reached 50 degrees Fahrenheit–ABOVE zero. That’s a pretty big differential in a relatively short amount of time. The last time we saw a February warm-up like this was in 2005, so it’s nothing we haven’t seen before…just perhaps a little unexpected considering how frigid it was just a short time ago. A new weather system is about to enter our state though, which means temperatures should get a little cooler after what appears to be a good chance of a winter storm on Sunday. For much of next week though highs are expected to dwindle at and around freezing, so we could see a pattern of freezing and melting for a while yet. As I mentioned a couple weeks ago, all this snow had to go somewhere, but it looks like instead of immediately making its way down to the river it soaked right into the ground. This is great news for those living along the river, but we’re certainly not out of the woods yet, especially considering we have another month of winter still to come. It is promising however, and since it appears that the soil was able to take a lot of snow melt this week (perhaps last October’s dry weather did offset the deluge of rain we experienced at the end of September), I would expect the flooding forecast to be a little less dire than previously predicted. 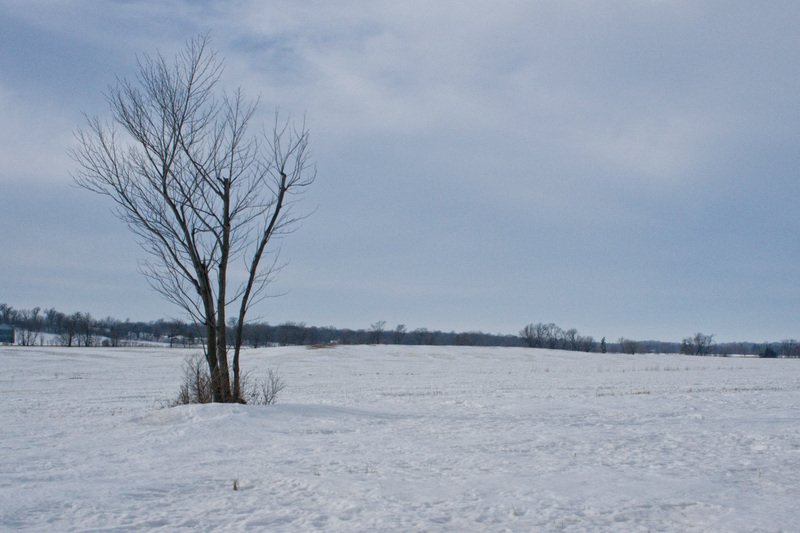 Looking west across the Coneflower Prairie, 2/16/11.